Our hometown paper The Stockton Record published a front page article this morning titled Re-Creating a Lead Legend. 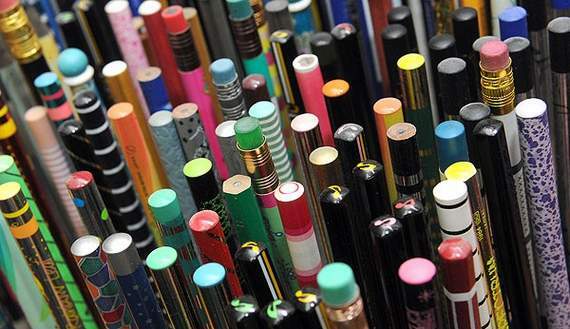 The article includes an interview with me as well as comments from Doug Martin of the American Pencil Collectors Society and John Gamber of Pencil Revolution blog. I am pleased to announce that we have received just in time for the holidays our new Palomino Blackwing Special Edition Gift Set, now available exclusively on Pencils.com. 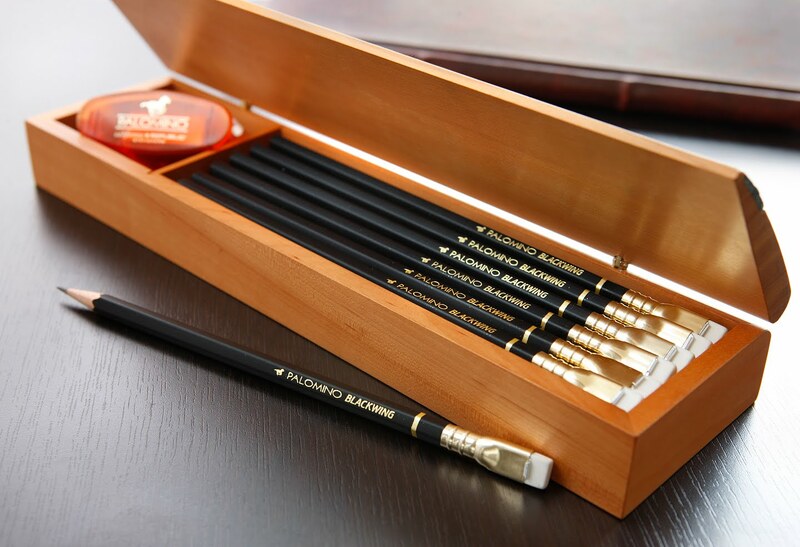 This is a beautiful new desktop set which includes a gorgeous natural wood grain box with the Palomino Blackwing brand embossed in a black leather trim, 24 Palomino Blackwing pencils and one of our KUM-Palomino Long Point sharpeners. At this point we have had just 200 of these box sets produced for the 2010 Holidays. 50 of these have been pre-reserved for our own internal company gift needs. This means there are just 150 sets available for sale in this Special Edition. At our normal Pencils.com margins this product represents a $130 value, however we have elected to offer this price at a price just under $100 per set in support of our loyal Palomino Blackwing fans.The box itself is an absolute gem produced in the Alsace Region of France featuring true artisan craftsmanship in the integration of the arts of woodworking and the production of fine quality CUIR de TERRE leather by our supplier Atelier de la Forêt. The Alsace is known as a land of winemakers & tanners and for the Vosages foothills, rivers and forests. The region is known for its environmentally friendly and sustainable method of selective harvest of the forest down to the individual tree level and for it’s craft woodworking. In former times the Alsace had a thriving tanning industry and today the names of streets, neighborhoods, families and business bear witness to this rich past. The family business owners of Atelier de la Forêt, located near the village of Zittersheim, continue these long held traditions of fine quality craftsmanship.The wood species used in this box is Sorbus Torminalis and is known commonly as the Wild Service Tree. Not knowing much about this particular species I took some time recently to investigate. Amazingly I found the interesting blog, Rowans, Whitbeams & Service Trees, maintained by Dr. Patrick Roper in the UK. Patrick is apparently a specialist in this group of trees and posts specifically about their history, use and preservation. One of the most interesting uses has been that of fermenting the berry’s for various beers as a substitute for hops and other alcoholic and non-alcoholic beverages alike. The tree was even known to Martin Luther for these qualities. 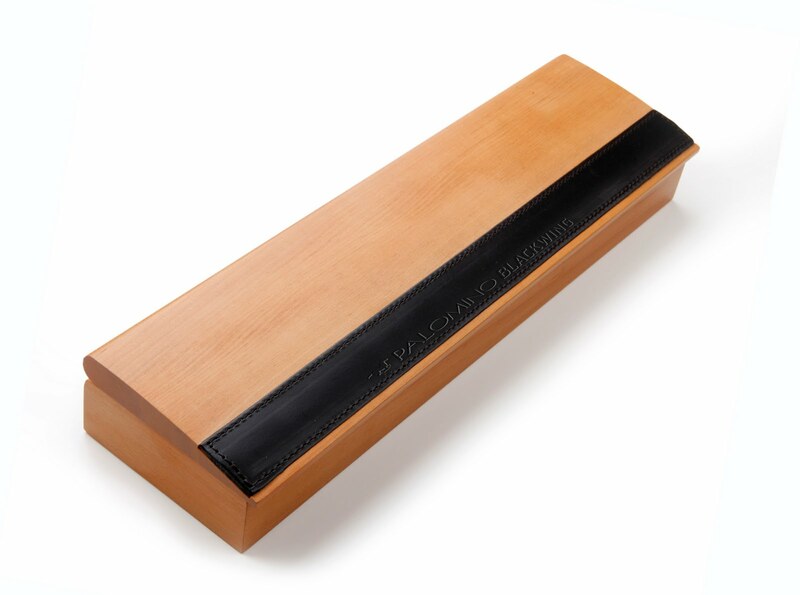 The blog also pro vided this helpful link addressing the the genetic conservation and use of this species.The leather trim on this box is just one fine example of the beautiful leather desk accessories produced by Atelier de la Foret and it is my hope we can collaborate on further special editions within the Palomino and Palomino Blackwing family of products in the future. The company’s marketing literature on their fine leather work is as poetic as the words that can be written with the Palomino Blackwings themselves. Selecting a great leather is like choosing a great wine… The CUIR de TERRE leather comes from the finest calf-skin and it is transformed by formulae written down in notebooks and loving guarded, in a place, a land, a knowledge that has been passed down in secret, within the family. … the skins delicately catch the light for the pleasure of sight and touch, reminiscent of a sturdy old Armagnac or an aged Port.With this beautiful new gift set we bring together a truly global combination of fine quality craftsmanship of several companies, high quality raw materials and several countries.. The Blackwing pencils start with our superior quality Japanese produced graphite core so paramount to the writing pleasure are then incased in our Genuine Incense Cedar wood from the forests of California, transformed into high quality wood slats in our Tianjin, China factory before final pencil production by our Japanese woodworking and finishing partners. These are paired with the finest German produced carbon steel blade hand sharpeners from KUM. All packaged lovingly in a true work of art from France. Unfortunately, I’ve been rather quiet lately on our progress with the Palomino Blackwing. Now that I’ve had a chance to catch up following my recent international travels I felt today would be a good time for a quick update on our progress for our fans. We’ve had the new Palomino Blackwing pencil available to customers now at Pencils.com for just over 45 days now. I have been quite pleased with the positive response and we have certainly benefited from some helpful press exposure, including Alex Beam’s Boston Globe video post “Better than an iPad?” and others. October was a busy month as we needed to step up our back office operations to support packing and shipping pencils at a new higher rate that started of with a bang when we received 300 orders alone on the very first day of sales on October 1st and another 150 or so over the next 3 days or so. To date we have sold through approximately one-quarter of our initial production run (nearly our full volume of 2 air express shipments) to over 1000 different customers. I feel like we are making good intial progress with the challenges of initial fulfilment . I want to thank each of our customers for being so patient and appreciative. Our overseas shipment should be arriving within the next 2 weeks after allowing for customs clearance so we hope to be able to add our new Palomino orange end dip 4B and 6B pencils to our sales offerings early in December. We have been making some slow progress towards finalizing the design and production details on the retail packaging schemes for Palomino Blackwing and the rest of the Palomino pencil range. Part of this has been tied to assessing what final design changes may be made if any to the future production of the pencils. Other aspects have been tied to vendor and materials evaluation. We continue to plan availability of retail packaging for early 2011. I have just completed a recent trip to China and Japan and hope to offer some more interesting and detailed posts down the road on various aspects of that trip to supplement the initial post on our visit to Beijing FILA Dixon pencil operations. While in Japan we visited many of our pencil slat customers but also had several meetings with the companies involved in the production of the Palomino Blackwing. This included visits to each of the graphite lead production, wood working and finishing subcontractor operations. At these meetings we reviewed a number of technical issues related to product design changes now under consideration as well as to production planning concerns. We currently expect our next production run will occur sometime around February or March 2011 depending on sales trends and lead time issues. A few more details are still being worked out and then I’ll be covering more on that topic in a future post once we finalize all our decisions within the next month. Finally, tomorrow we will launching sales of our Palomino Blackwing Special Edition Gift Set which will be fully described in a separate post, but will include 24 Palomino Blackwings and a Palomino-KUM long point sharpener in a beatiful natural wood grain and leather trimmed box with the Palomino Blackwing logo embossed in the leather. This is a limited run of just 200 boxes of which just 150 will be offered for sale. The video accompanying this post shows the presentation of one of these gift sets to our Palomino Blackwing finishing subcontractor. His wife came in right after this and liked it so much she said she may have to take it from him, remove the pencils and use it for her sewing supplies.